Background: Heart rhythm turbulence is classically impaired in patients with previous myocardial infarction and congestive heart failure and is poorly investigated in patients with essential hypertension. Objective: To evaluate heart rhythm turbulence parameters (turbulence onset, (TO); turbulence slope, (TS) in a series of hypertensive patients while gaining insight into autonomic nervous system dysfunction. Setting and Design: University hospital, cross-sectional monocentric study. Materials and Methods: Heart rhythm turbulence was assessed in 50 hypertensive (case group) and 40 normotensive patients (control group). Results: TO and TS were found independently correlated with hypertension. The mean TO was found at -1.64% ± 2.85% in the normotensive patients compared to 1.21% ± 1.95% in the hypertensive patients; the mean TS was found at 4.29 ± 3.18 ms/RR in the normotensive patients compared to 2.27 ± 0.93 ms/RR in the hypertensive patients. Hypertension has a predictive value on heart rhythm turbulence impairment (OR 4.99, 95% CI 1.28-19.41, P = 0.02). Insights into the role of autonomic nervous system dysfunction for the management of hypertensive patients and prevention of malignant ventricular arrhythmia are presented and discussed with regard to heart rhythm turbulence. Conclusion: Essential hypertension is correlated with blunted heart rhythm turbulence parameters. Sudden cardiac death remains a significant medical burden despite current medical progress. For more than two decades, it has been demonstrated that essential hypertension (HTN) and left ventricular hypertrophy represent risk factors for cardiovascular morbidity and mortality including sudden cardiac death. Identification of patients at high risk of sudden cardiac death is essential for the implementation of prophylactic strategies for reducing mortality rates related to sudden cardiac events. From this perspective, many clinical markers are used in clinical practice including left ventricular ejection fraction, ventricular hyperexcitability, ventricular late potentials, T wave alternance, QT dispersion, heart rate variability, and heart rate turbulence (HRT). The aim of this study is to assess the potential correlation between HRT and essential HTN, focusing on the rationale of assessment of HRT in this setting and on the role of the autonomic nervous system (ANS), with the perspective of a more adapted and strategic management of hypertensive patients. This was a cross-sectional monocentric study, performed at the University Hospital Notre Dame de Secours, Byblos, Lebanon. Recruitment took place between January 2013 and December 2013. All included patients had a continuous 24-hour electrocardiogram (Holter) performed on an outpatient basis; the recording was performed while subjects went about their daily routine. HRT parameters, (TO and TS), were calculated using HRT software (GE Healthcare). The study population comprised 90 eligible patients, including 50 hypertensive (HTV) and 40 normotensive (NTV) patients (control group). The patients were eligible for inclusion if they fulfilled the following criteria: Age between 19-81 years old and had received an electrocardiogram, echocardiogram, and Holter recording during the recruitment period. The exclusion criteria consisted of the following: Absence of PVC, interpolated PVC, presence of complete bundle branch block, class 1 anti-arrhythmic drugs intake; and an incomplete medical record. Moreover, in order to avoid the confounding effect of current cardiac or extracardiac diseases, any of the following conditions constituted criteria for exclusion: Previous myocardial infarction, significant valvular heart disease, congestive heart failure, impaired left ventricular systolic function, inappropriate sinus tachycardia, sinoatrial dysfunction; uncontrolled HTN, atrial fibrillation, pacemaker or implantable cardioverter defibrillator, dilated cardiomyopathy, Chagas disease, hyperthyroidism, mitral valve prolapse, hemodialysis with advanced renal disease, and metabolic syndrome. All patients had their blood pressure measured and recorded during their visit for a Holter recording; patients were considered HTV based on their medical treatment, their medical history, and their medical record. Uncontrolled HTN was considered to be present if systolic blood pressure was >150 mmHg and/or diastolic blood pressure > 90 mmHg, with or without anti-HTV therapy. Eligible patients with coronary artery disease were asymptomatic or had stable angina; previous myocardial infarction was considered present based on patient history, medical record along with electrocardiogram and echocardiogram findings. Significant valvular heart disease was considered to be present when moderate to severe valvular stenosis or regurgitation was documented. Impaired left ventricular systolic function was considered to be present when the ejection fraction was <50%. RR intervals and QRS morphology were automatically assessed by a digitized Holter analyzer, and they were validated after review and editing by an electrophysiologist. The accepted tachogram consisted of a sequence of sinus R-R intervals with five preceding and 15 succeeding to a PVC; HRT parameters were measured using tachograms that were averaged over long-term recordings. HRT indices (TO and TS) were calculated using the guideline standards of the International Society for Holter and Non-invasive Electrocardiology. TO values < 0 and TS values > 2.5 ms/RR were considered normal. TS was calculated as the maximum slope of the regression line over any sequence of five R-R intervals within the first 15 sinus beats succeeding a PVC. TO is defined as the percentage of intervals difference between the first two normal cycles following PVC and the last two normal intervals preceding the PVC. PVC was accepted only when embedded into five preceding and 15 succeeding R-R intervals; accepted PVCs are those with prematurity > 20% and a compensatory pause > 120% of the average of the last five intervals preceding the PVC. The algorithm for HRT quantification is programmed to ensure that the sinus rhythm immediately preceding and following the PVC is free from arrhythmia and artifacts. From this perspective, we used filters to reject HRT calculations in these cases: RR < 200 ms; RR > 2500 ms; the difference between two successive RR intervals > 200 ms; and the RR interval difference > 20% from the baseline interval (calculated as mean of the five last sinus intervals). The study protocol conformed to the ethical principles for medical research involving human subjects, as outlined in the Declaration of Helsinki (version 2013). Analysis was performed using the Statistical Package for the Social Sciences software. Data were expressed as mean ± standard deviation, or number and percentage, as appropriate. The differences between the two groups were analyzed with the Student's t-test for continuous variables and with Chi-square test for categorical variables. Multivariate analysis was applied using binary logistic regression to estimate the odds ratio and their 95% confidence intervals. Forward LR approach was used to determine the predicting variables from the set of variables found to have significant differences. A P-value less than 0.05 was considered statistically significant. Of the 90 patients studied, 40 were NTV and 50 were HTV. The mean age was 53.88 ± 21.62 years in the NTV group and 72.28 ± 8.43 years in the HTV group (P < 0.0001). Parameters included in the baseline characteristics included: Age, gender, smoking status, coronary artery disease (without infarction), diabetes mellitus, dyslipidemia, diastolic dysfunction (without heart failure), beta blockers therapy, calcium channel blockers therapy, and interventricular septum thickness. 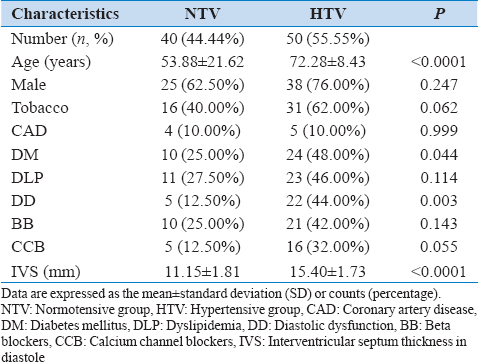 Univariate analysis showed a significant difference between the NTV and HTV groups regarding four variables: Age, diabetes mellitus, diastolic dysfunction, and septal wall thickness [Table 1]. Other parameters did not differ significantly; namely, there was no difference in terms of the minimum, maximum, and mean heart rate between the two groups. Similarly, there was no significant difference between the two groups regarding the number of PVC/24 hours, the PVC coupling interval, and the post-PVC cycle length. The mean TO and TS values were equal to -1.64 ± 2.85 and 4.29 ± 3.18 in the NTV group, compared to 1.21 ± 1.95 and 2.27 ± 0.93 in the HTV group, respectively (P < 0.0001). The percentage of patients with blunted HRT (both TO and TS abnormal) was significantly higher in the HTV group when compared to the NTV group (40% versus 7.5%) [Table 2]. 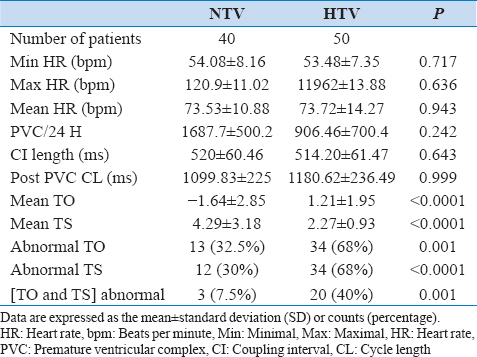 Table 2: Significant difference in TO and TS between the normotensive group (NTV) and hypertensive group (HTV) groups. Analysis of predictors of abnormal HRT was based on the model of both TO and TS impairment. Nine parameters were included in the univariate analysis as predictors of HRT: Age, tobacco, coronary artery disease, diabetes, interventricular septum, number of PVC/24 hours, mean heart rate, PVC coupling interval, and HTN. 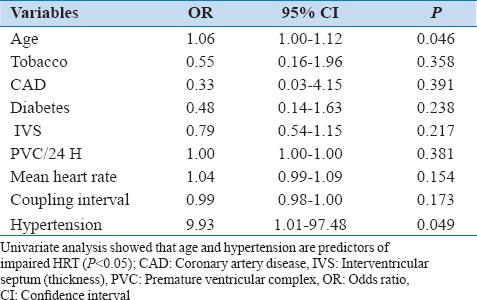 Among the investigated parameters, only age (OR 1.06, 95% CI 1.00-1.12, P = 0.046) and HTN (OR 9.93, 95% CI 1.01−97.48, P = 0.049) had a significant correlation in the model [Table 3]. Multivariate analysis [Table 4] included variables with significant value in the univariate study (age and HTN) and yielded a significant predictive value of HTN on HRT (OR 4.99, 95% CI 1.28-19.41, P = 0.02). In this study, results showed that four parameters (increased age, diabetes, diastolic dysfunction, and interventricular septum thickness) were more prevalent in the HTV group [Table 2]. Diastolic dysfunction is an obvious finding consecutive to left ventricular hypertrophy in HTN. Guo et al. did not find any causal relationships between diastolic dysfunction and HRT. Moreover, our search did not identify any report correlating diastolic dysfunction and HRT. In addition, HTV patients had a higher mean age (P < 0.001), and this is explained by the fact that HTN is more prevalent with increased age. The study design did not allow for the assessment of the effect of aging on HRT; however, a previous report  showed that increasing age leads to impairment of HRT parameters. Similarly, previous reports showed that diabetes is correlated with blunted HRT, , and this phenomenon is mediated via ANS, baroreflex sensitivity, and endothelial dysfunction in this context. , In the present study, the design and objective of the study did not allow for the identification of an independent correlation between diabetes and HRT [Table 3]. The presence of left ventricular hypertrophy by itself is a consequence of long sustained HTN. Also, it is an established cause of diastolic dysfunction and sudden cardiac death. , In this study, multivariate analysis did not show an independent correlation between septal thickness and HRT. Furthermore, there is currently no evidence that left ventricular hypertrophy is causative of HRT blunting, and it is rather an associated comorbidity in HTN. Many reports , have shown that HRT is blunted, even in pre-HTV and NTV patients who do not have night dipping of blood pressure and who do not necessarily have left ventricular hypertrophy. Finally, we mention that many other factors may have an impact on HRT parameters. TO and TS are critically vagal dependent; , exposure to tobacco smoke induces abnormal HRT in patients with arterial HTN. TS and TO are closely dependent on the PVC coupling interval and on the retrograde conduction status. Sestito et al. reported that HRT variables are impaired in patients with stable coronary artery disease, even without previous myocardial infarction. In the present study, there was no significant difference between the two groups regarding tobacco use, PVC coupling interval, and stable coronary artery disease. Blunted HRT theoretically exposes an individual to an increased risk of developing malignant ventricular arrhythmia. Classically, blunted HRT is useful for assessing the prognosis in patients with congestive heart failure and/or previous myocardial infarction. , However, HRT may have clinical applications in other clinical conditions-namely, in essential HTN for evaluating arrhythmic risk, assess condition severity, prognosis,  and efficacy of anti-HTV therapy beyond lowering blood pressure. HTV patients with blunted HRT should be considered for anti-HTV drugs such as beta blockers that may improve HRT and protect against dysrhythmias. , HRT is a non-invasive and relatively non-expensive test. In view of this, we estimate that HRT realization in HTV patients is a cost-effective procedure and should be implemented more frequently in the future. The study is monocentric, and the study population is small; these factors may compromise the results. The estimation of left ventricular hypertrophy was based only on septal thickness. This is a simplified method, and indexed left ventricular mass is a preferred method. Echocardiographic evaluation was performed by different operators, and assessment of some parameters may not be homogeneous. HRT parameters show circadian variability. Also, orthostatic position has an impact on baroreflex sensitivity indices and on TS values. These factors could have a confounding effect on the study's results. The incidence of false-positive or false-negative HRT results can go up to 19%,  and this is related to clinical settings and to potential confounding variables. The present study showed significant impairment of HRT in patients with essential HTN. HRT is a valuable tool in practice; it allows for the assessment of ANS dysfunction in many cardiac conditions, namely coronary artery disease, heart failure, and HTN. Patients with essential HTN are at higher risk of ventricular arrhythmia, especially when HTN is associated with left ventricular hypertrophy. In this context, HRT assessment allows for the estimation of the potential risk of ventricular arrhythmia and sudden cardiac death, also it allows for monitoring the efficiency of anti-HTV therapy, which should aim to decrease morbidity and mortality, beyond lowering blood pressure. 1. Schmieder RE, Messerli FH. Ventricular arrhythmia and sudden cardiac death: The significance of left ventricular hypertrophy as risk factor. Schweiz Med Wochenschr 1993;123:99-107. 2. Bauer A, Malik M, Schmidt G, Barthel P, Bonnemeier H, Cygankiewicz I, et al. Heart rate turbulence: Standards of measurement, physiological interpretation, and clinical use: International Society for Holter and Noninvasive Electrophysiology Consensus. J Am Coll Cardiol 2008;52:1353-65. 3. Schmidt G, Malik M, Barthel P, Schneider R, Ulm K, Rolnitzky L, et al. Heart-rate turbulence after ventricular premature beats as a predictor of mortality after acute myocardial infarction. Lancet 1999;353:1390-6. 4. Guzik P, Schmidt G. A phenomenon of heart-rate turbulence, its evaluation, and prognostic value. Card Electrophysiol Rev 2002;6:256-61. 5. Grimm W, Schmidt G, Maisch B, Sharkova J, Müller HH, Christ M. Prognostic significance of heart rate turbulence following ventricular premature beats in patients with idiopathic dilated cardiomyopathy. J Cardiovasc Electrophysiol 2003;14:819-24. 6. Ribeiro AL, Schmidt G, Sousa MR, Lombardi F, Gomes ME, Perez AA, et al. Heart rate turbulence in Chagas disease. Pacing Clin Electrophysiol 2003;26(1 Pt 2):406-10. 7. Osman F, Franklyn JA, Daykin J, Chowdhary S, Holder RL, Sheppard MC, et al. Heart rate variability and turbulence in hyperthyroidism before, during, and after treatment. Am J Cardiol 2004;94:465-9. 8. Gunduz H, Arinc H, Kayardi M, Akdemir R, Ozyildirim S, Uyan C. Heart rate turbulence and heart rate variability in patients with mitral valve prolapse. Europace 2006;8:515-20. 9. Celik A, Melek M, Yuksel S, Onrat E, Avsar A. Cardiac autonomic dysfunction in hemodialysis patients: The value of heart rate turbulence. Hemodial Int 2011;15:193-9. 10. Yýlmaz M, Akyazýcý F, Arýcan Ozluk O, Peker T, Karaagac K. Heart rate turbulence in patients with metabolic syndrome. Metab Syndr Relat Disord 2013;11:132-5. 11. Wichterle D, Melenovsky V, Malik M. Mechanisms involved in heart rate turbulence. Card Electrophysiol Rev 2002;6:262-6. 12. Papaioannou VE. Heart rate variability, baroreflex function and heart rate turbulence: Possible origin and implications. Hellenic J Cardiol 2007;48:278-89. 13. Erdem A, Uenishi M, Küçükdurmaz Z, Matsumoto K, Kato R, Hara M, et al. Cardiac autonomic function measured by heart rate variability and turbulence in pre-hypertensive subjects. Clin Exp Hypertens 2013;35:102-7. 14. Sahiner L, Okutucu S, Karakulak UN, Aytemir K, Fatihoglu SG, Kaya EB, et al. Assessment of the relationship between non-dipping phenomenon and heart rate turbulence. Cardiol J 2012;19:140-5. 15. Poreba R, Derkacz A, Silber M, Andrzejak R. Assessment of cardiac arrhythmias in patients suffering from essential hypertension. Pol Arch Med Wewn 2004;111:183-9. 16. Wustmann K, Kucera JP, Scheffers I, Mohaupt M, Kroon AA, de Leeuw PW, et al. Effects of chronic baroreceptor stimulation on the autonomic cardiovascular regulation in patients with drug-resistant arterial hypertension. Hypertension 2009;54:530-6. 17. Saadeh AM, Jones JV. Predictors of sudden cardiac death in never previously treated patients with essential hypertension: Long-term follow-up. J Hum Hypertens 2001;15:677-80. 18. Jurek S, Sredniawa B, Musialik-£ydka A, Kalarus Z. Heart rate turbulence--a new predictor of sudden cardiac death. Pol Merkur Lekarski 2007;23:55-9. 19. Guo HP, Tang QZ, Deng W, Zhou H, Qiu TY, Yan L, et al. Relationship among heart rate turbulence, QT dispersion and heart function in patients with dilated cardiomyopathy. Zhonghua Yi Xue Za Zhi 2010;90:3255-8. 20. Schwab JO, Eichner G, Shlevkov N, Schrickel J, Yang A, Balta O, et al. Impact of age and basic heart rate on heart rate turbulence in healthy persons. Pacing Clin Electrophysiol 2005;28 Suppl 1:S198-201. 21. Francis J, Watanabe MA, Schmidt G. Heart rate turbulence: A new predictor for risk of sudden cardiac death. Ann Noninvasive Electrocardiol 2005;10:102-9. 22. Gong C, Huang SL, Huang JF, Zhang ZF, Luo M, Zhao Y, et al. Effects of combined therapy of Xuezhikang Capsule and Valsartan on hypertensive left ventricular hypertrophy and heart rate turbulence. Chin J Integr Med 2010;16:114-8. 23. Bauer A, Zürn CS, Schmidt G. Heart rate turbulence to guide treatment for prevention of sudden death. J Cardiovasc Pharmacol 2010;55:531-8. 24. Kawasaki T, Azuma A, Asada S, Hadase M, Kamitani T, Kawasaki S, et al. Heart rate turbulence and clinical prognosis in hypertrophic cardiomyopathy and myocardial infarction. Circ J 2003;67:601-4. 25. Celik A, Koç F, Kadi H, Ceyhan K, Erkorkmaz U. Inflammation is related to unbalanced cardiac autonomic functions in hypertension: An observational study. Anadolu Kardiyol Derg 2012;12:233-40. 26. Lin LY, Lai LP, Lin JL, Du CC, Shau WY, Chan HL, et al. Tight mechanism correlation between heart rate turbulence and baroreflex sensitivity: Sequential autonomic blockade analysis. J Cardiovasc Electrophysiol 2002;13:427-31. 27. Gaæ P, Sobieszczañska M. Effects of cigarette smoke on Holter ECG recordings in patients with arterial hypertension. Part 2: Parameters of heart rate turbulence. Environ Toxicol Pharmacol 2014;37:600-7. 28. Lee KT, Lai WT, Chu CS, Yen HW, Voon WC, Sheu SH. Effect of electrophysiologic character of ventricular premature beat on heart rate turbulence. J Electrocardiol 2004;37:41-6. 29. Sestito A, Valsecchi S, Infusino F, Sgueglia GA, Bellocci F, Zecchi P, et al. Differences in heart rate turbulence between patients with coronary artery disease and patients with ventricular arrhythmias but structurally normal hearts. Am J Cardiol 2004;93:1114-8. 30. Lin LY, Hwang JJ, Lai LP, Chan HL, Du CC, Tseng YZ, et al. Restoration of heart rate turbulence by titrated beta-blocker therapy in patients with advanced congestive heart failure: Positive correlation with enhanced vagal modulation of heart rate. J Cardiovasc Electrophysiol 2004;15:752-6. 31. Cygankiewicz I, Wranicz JK, Bolinska H, Zaslonka J, Zareba W. Circadian changes in heart rate turbulence parameters. J Electrocardiol 2004;37:297-303. 32. Makai A, Korsós A, Makra P, Forster T, Abrahám G, Rudas L. Spontaneous baroreflex sensitivity and heart rate turbulence parameters: Parallel responses to orthostasis. Clin Auton Res 2008;18:74-9. 33. Grimm W, Sharkova J, Christ M, Schneider R, Schmidt G, Maisch B. Heart rate turbulence following ventricular premature beats in healthy controls. Ann Noninvasive Electrocardiol 2003;8:127-31.